The private equity firm is selling bonds backed by rent on foreclosed homes. Not much data exists for this market, which may make investors nervous. But with home ownership dropping and renting on the rise, this rare example of post-crisis financial innovation may have a future. 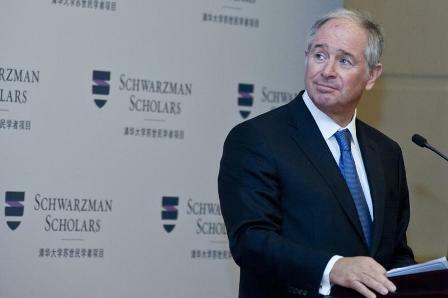 Stephen Schwarzman, chairman and CEO of the Blackstone Group, gives a speech at a news conference for the launch of the Schwarzman Scholars at the Great Hall of the People in Beijing, April 21, 2013. On Oct. 30 Blackstone began marketing securities backed by rents collected on a portfolio of American houses the company owns. The transaction would mark the first ever asset-backed security that uses single-family home rentals to back bonds. The deal is set to raise $479 million, about 60 percent of which will be rated AAA, Reuters IFR Markets reports. Blackstone bought the houses out of foreclosure and refurbished them before renting them out. Almost 90 percent of them are located in or around areas that were badly hit during the housing slump, including Phoenix, Arizona; Riverside, Los Angeles and Sacramento, California; Atlanta, Georgia; and Tampa, Florida.